They used to think dinosaurs were reptiles. Now they say they were warm blooded since they had feathers. For almost 10 years the NSA (National Science Foundation) has stated the asteroid extinction event for dinosaurs was wrong. Even though schools still teach it as gospel to kids. Here is the NSF article. So instead of an asteroid killing them. I propose a new theory. 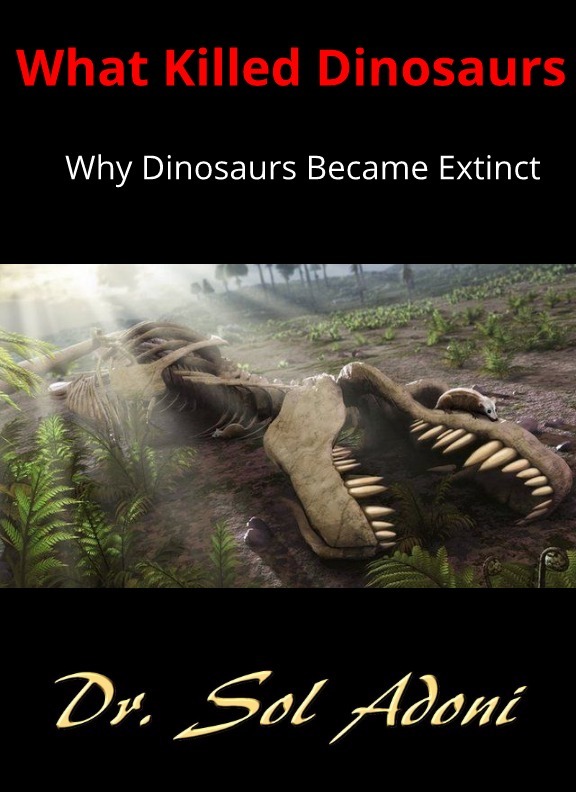 My new theory is Dinosaurs were so huge emitting so much carbon dioxide (CO2) the plants and trees on Earth became so big that it created a hot house effect of over 130 surface degrees on Earth and all the large warm blooded animals died from heat stroke and only small mammals that could burrow survived as did reptiles that can survive high surface heat. That’s my new theory on why dinosaurs went extinct. It was a Hot House Effect caused by Dinosaurs weighing up to 200 tons emitting almost 5,000 pounds a day of CO2 each. A human at 200 pounds emits 2.5 pounds of CO2 a day. So many dinosaurs we’re emitting 2000 times that amount. It is why CO2 levels in the age of Dinosaurs were 500% greater than today. This high CO2 level fueled plant growth which fueled rich oxygen levels allowing animals to grow to incredible sizes. Dinosaurs kept growing and growing from plenty of plant food and rich oxygen levels until the surface heat from a hot house effect killed them. As long as dinosaurs kept getting richer and richer oxygen levels from abundant plant growth, the herbavore dinosaurs got bigger and bigger until the ecosystem crashed due to heat. The bigger dinosaurs that ate trees and plants fueled higher CO2 levels fueling bigger trees and plants fueling higher richer oxygen levels. Dinosaurs that ate plants got huge emitting more CO2 fueling plants and surface heat. Dinosaurs that ate dinosaurs got bigger as well. All that carbon dioxide from huge dinosaurs fueled the plants creating a hot house effect not a green house effect. This warmed the surface of Earth and oceans until it reached levels killing larger animals and fish. The plants thriving created a hot house effect with too much surface heat and warm blooded dinosaurs all died out from high surface heat yet small mammals could burrow and they survived since they could escape the surface heat that killed large surface animals. Once the source creating the high CO2 levels died the larger trees and plants went back to being smaller sizes and the rich oxygen levels dropped. Asteroids hit all the time, so it’s not probably an asteroid event just killed large warm blooded dinosaurs and left small mammals alive. New testing of the alleged asteroid crater thought to have killed the dinosaurs off shows that asteroid hit 300,000 years or more earlier than the die off. Also, many species of plants died off, these needed high CO2 levels and heat. Once the dinosaurs died the CO2 and heat dropped as plants and trees stop growing so big from high CO2 emissions from large dinosaurs so lots of plants died off as well that needed high CO2 levels and high surface heat. The temperature of the oceans would have dropped as well as oxygen levels of the oceans so fish species needing warmer water and more oxygen would has also died off when the dinosaurs died cooling surface temperatures and ocean water from less CO2 levels. A global nuclear winter would have killed all plant and mammal life. It didn’t happen. My theory kills only dinosaurs and large surface mammals as happened leaving smaller burrowing animals able to survive. My theory also explains why plant life and sea life needing high temperatures died off. The asteroid theory doesn’t explain why so many plants, fish and animals survived survived and thrived on an apocalyptic Earth from nucler winter by an extinction level asteroid. My theory is simply better than the asteroid theory which even the National Science Foundation has said an asteroid did not kill off the dinosaurs. NSF.GOV site says it here.